Imagine a circuit with two resistors in parallel. Let’s say one is 100 Ohms and the other 100000 (one hundred thousand) Ohms. Can you quickly find the combined value of the two of them? What if both of the values are 300 Ohms? You *could* use the formula for resistors in parallel and calculate it. But there’s a quicker way. The total resistance of two resistors in parallel is always smaller than the smallest resistor value. If the difference between the two resistors is large (100 times or more), the resulting value is approximately the same as the smallest resistor. 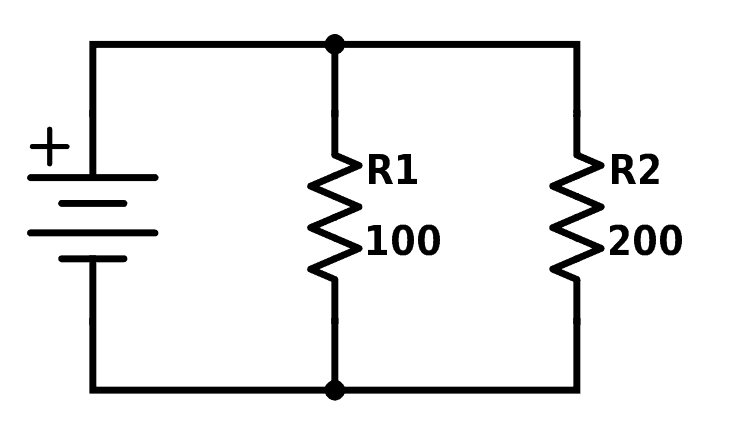 If the two values are equal, the total resistance is half of the resistance value of one of the resistors. 100 Ohm in parallel with 100000 (one hundred thousand) Ohms is approximately 100 Ohms. 300 Ohms in parallel with 300 Ohms is 150 Ohms. When you’ve done this enough, it becomes second nature. This skill, together with a few more basic analysis-skills, will help your ability to look at a circuit diagram and understand what it does/how it works. The course teaches you to combine resistances, and then “see” the voltages and currents in the circuit. Which is probably one of the most important theoretical skills in electronics. Nice tips! Anyways there are a lot of calculators which makes it easy to calculate the resistance values quickly. is it just me or… wouldn’t 100ohm in parallel with 100ohm = approx 50ohm equivalent resistance? I guess the point made you think it was 100 instead of 100 thousand. I’ll update that to avoid confusion in the future.